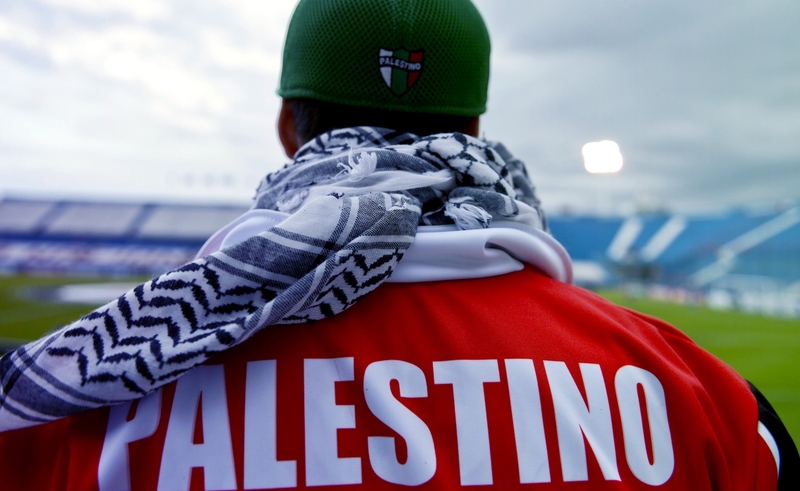 Chile has the largest population of Palestinians outside the Arab world, and an unexpected ambassador of the struggle: the Deportivo Palestino football club. So goes an old saying in Spanish, one that Dr. Lina Meruane - Chilean writer and scholar of Palestinian descent - says has many different iterations, including one that says that for every single village, there is in fact a Palestinian policeman, a Palestinian doctor, and a Palestinian pastor. Today, there are between 450,000 and half a million Chileans of Palestinian descent, many of whom reside in Santiago, the capital of Chile some 13,220 kms away from Jerusalem. Through 150 years and a complex history of integration, persecution, and negotiation of identity, there has emerged a distinct identity of ‘Chilestinian’. 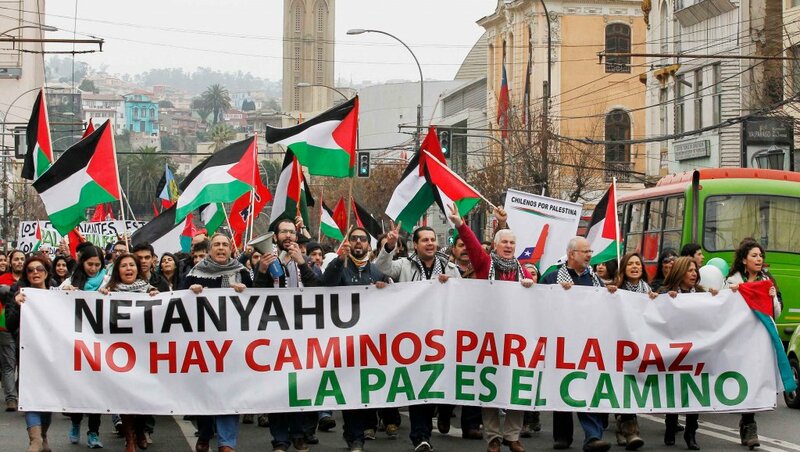 A pro-Palestine rally in Chile, banner reads "Netanyahu: there are no paths to peace, peace is the path," in reference to the Israeli prime minister's phrasing of different prerequisites to starting the 'path' to peace, including the 'normalisation' of relations. They translated their names into Spanish equivalents (my grandfather, Issa or Jesus, became Salvador)...They toned down their surnames, unless immigration officials had already done so at the entry point (Marwani became Meruane)...In the meantime, they lost their tongue. This half-a-million-strong community has its roots in the Christian enclaves surrounding Bethlehem, from where, in the late 1800s, the first wave of migration to Latin America began. 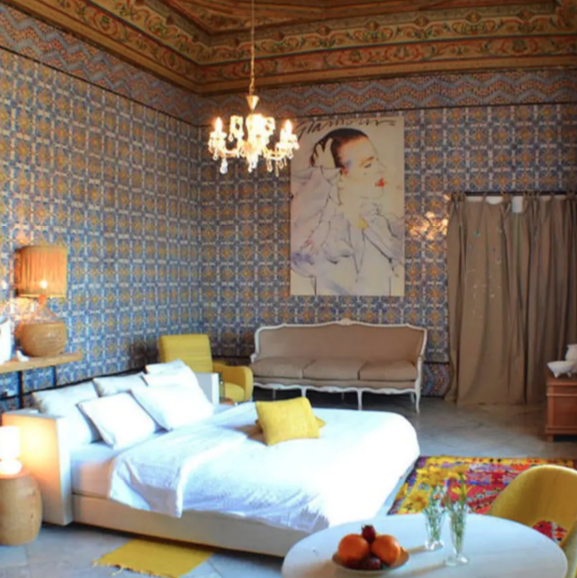 Meruane’s own grandparents were part of this wave, migrating independently from Beit Jala on the outskirts of Bethlehem before meeting and marrying in Chile. 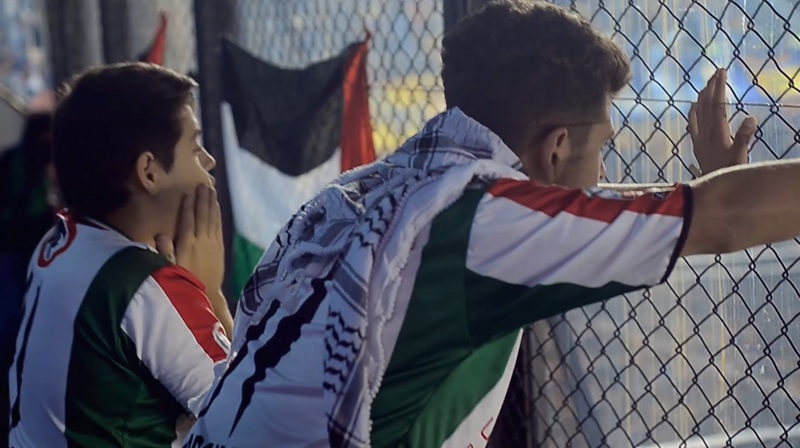 A fan watches the Palestino football team, still from Cuatro Colores. Criollo elites, direct descendants of the Spanish and the Portuguese, welcomed all migration that would help whiten-out black and indigenous lineages. But why would these fleeing populations choose a destination that necessitated months spent in cargo ships from Jaffa to the coast of France, onto Brazil or Argentina - “accommodated between the luggage and amongst rats, or as third-class passengers,” as Meruane puts it - and then days on mules through the deserted pampa and across the frozen Andes Mountains, before a final train to Chile? The answer seems to be in the particular alignment of systematic racism on the one hand and policies of inclusion on the other, which proved relatively favorable to Palestinians, at the expense of other communities. 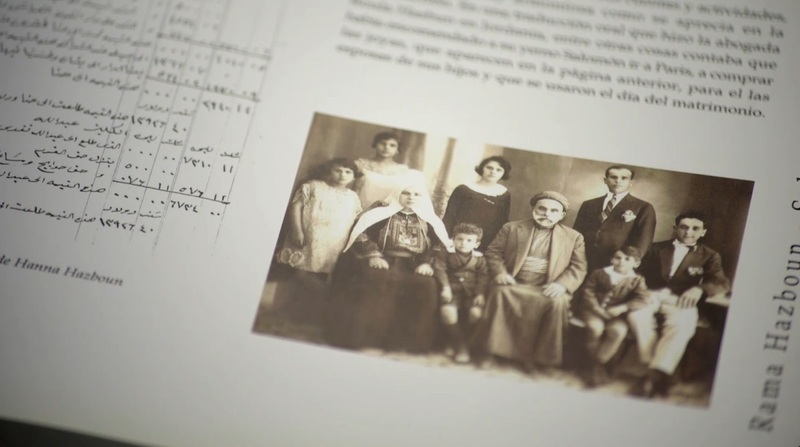 Family history of the Hasbùns, who immigrated from Palestine in 1933 to avoid being drafted into the British army, still from Cuatro Colores. While this coincided with a parallel wave of immigration to North America, Latin American countries like Chile did not adopt the same exclusionary policies that the US did. In contrast to the Asiatic Barred Zone of 1917, the Emergency Quota Act of 1921, and the Johnson-Reed Quota Act of 1924, which sequentially limited non-Anglo Saxon immigration, Chile adopted a slightly more tolerant attitude, albeit from racist sensibilities of its own. “Criollo elites, direct descendants of the Spanish and the Portuguese, welcomed all migration that would help whiten-out black and indigenous lineages,” explains Meruane, qualifying that Arab and Jewish ‘whiteness’ was certainly put into question, which is why the two communities were never given the migratory incentives that white Europeans were entitled to. They were, however reluctantly, allowed to settle into the country and slowly move into a culture on a sliding scale of tolerance and dehumanisation. While this less-than-politically-correct writer - whose name time has thankfully thrown into anonymity - refers to the community with the old Islamophobic term ‘Mohammedans’ (regardless of their predominantly Christian background) the more popular misnomer was Turcos (Turks). Ignoring the distinctions between Middle Eastern peoples - as German culture does today by calling all vaguely brown people ‘Kanaken’ - Chilean society named them according to the authority which had issued their passports: the Ottoman Empire, the very violence they were fleeing. 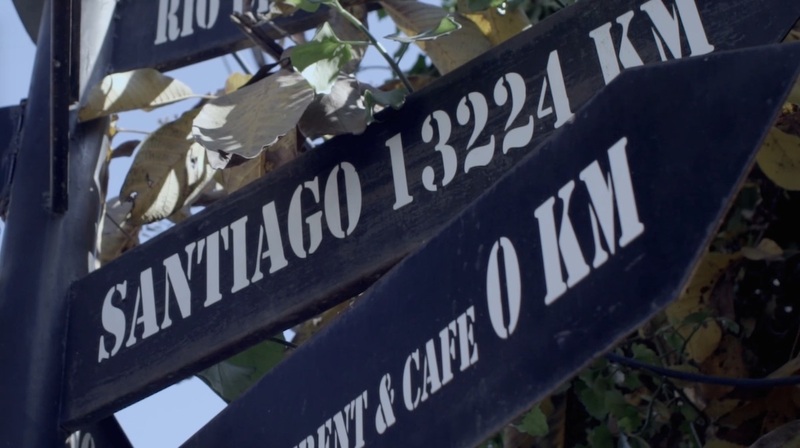 A sign towards Santiago in Ramallah in the West Bank, still from Cuatro Colores. 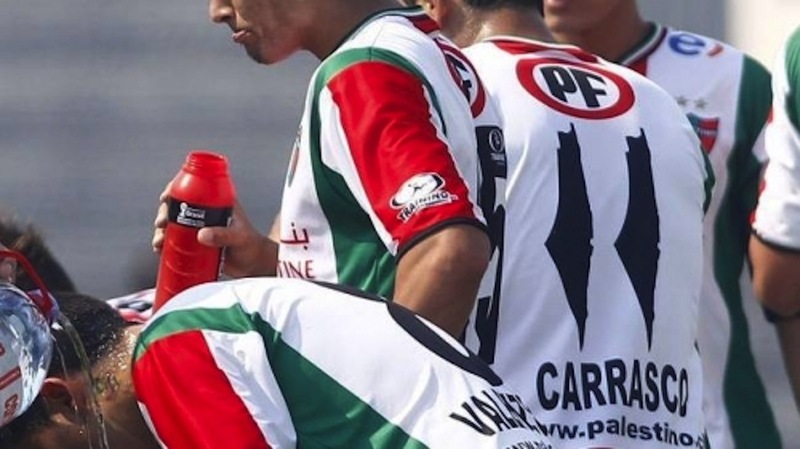 Soon after the Nakba, Palestino’s president received an offer of 200,000 dollars from the Jewish community in Chile to change the name of the team from ‘Palestino’ to ‘Arabe’. In 2014, Palestino was fined for replacing the 1's on their uniforms with the historical map of Palestine and forced to change it. 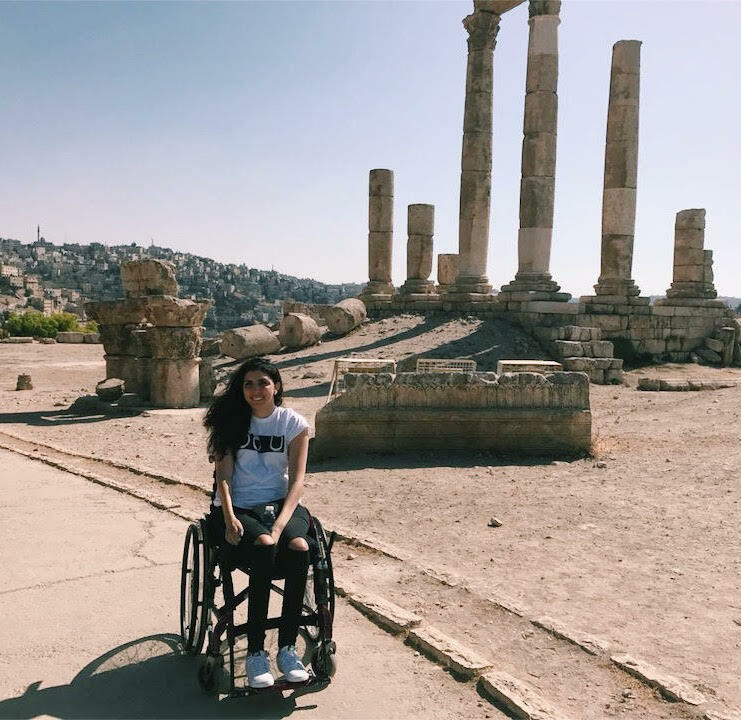 Though they had to eventually abide by the decision, they released a statement defending the t-shirt, where they said: "For us, free Palestine will always be historical Palestine, nothing less." 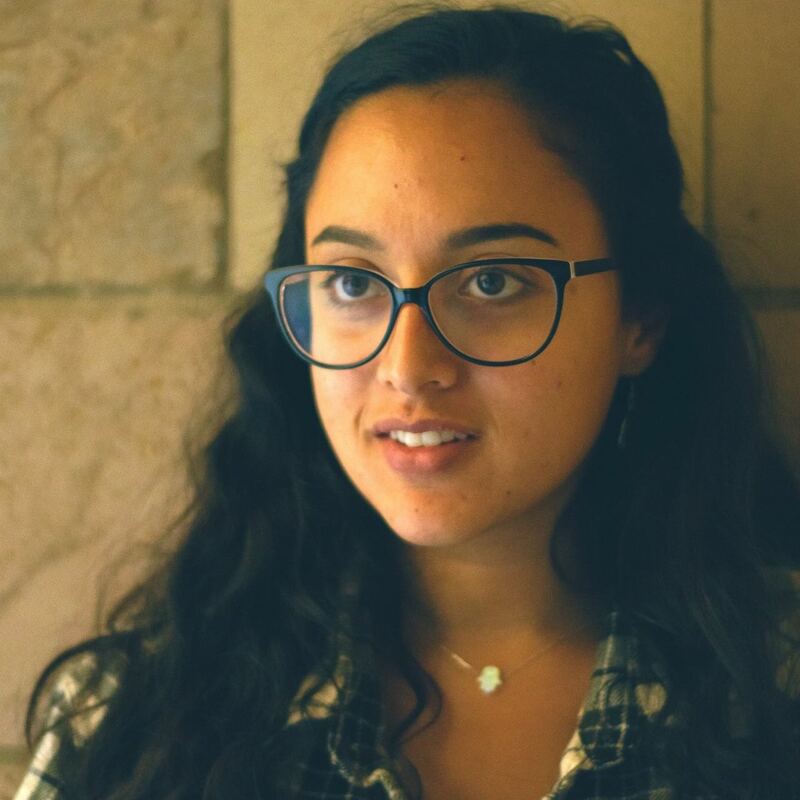 This constellation of intentional political decisions has made them the voice of the Palestinian struggle in broader Chilean society, an awareness mission throughout Latin America, and a message of solidarity to Palestinians living under Israeli occupation. Because of this, the club’s historical moments of attack and response serve as a lens through which to read the history of the Chilestinians, particularly the sheer endurance of a community despite powerful, international, multipolar forces to the contrary. Though the club’s origins are decades older, the football club’s professionalisation came after - and, importantly, because of - the Nakba of 1948 and the creation of Israel. “When the problem started in Palestine, we wanted to create a team and name it ‘Palestino’ (Palestine) so people would know us,” recounts Carlos Hasbún, a member of Palestino’s first professional team, in Cuatro Colores, a documentary about the club by Chilean filmmaker Aldo Guerrero. The reaction to the zenith of Israel’s settler colonialism was to assert the existence of not only the community, but their explicitly Palestinian identity. Protest in Santiago, Chile, in July 2014 against attacks on Gaza. The sign reads "Humanity is Palestinian." Image credit: Eliseo Fernandez. Soon after the Nakba, historian Fuad Dawabe recounts, Amador Yarur, Palestino’s president at the time, received an offer of 200,000 dollars from the Jewish community in Chile to change the name of the team from ‘Palestino’ to ‘Arabe’, in echo of the still-persistent erasure of Palestinian-ness that the Israeli state attempts by calling Palestinians with Israeli citizenship ‘Arabs’. Needless to say, the offer was promptly rejected. The Chilestinian community later underwent a period of division and suppression in 1973, when a US-backed coup d’etat brought dictator Augusto Pinochet to power. 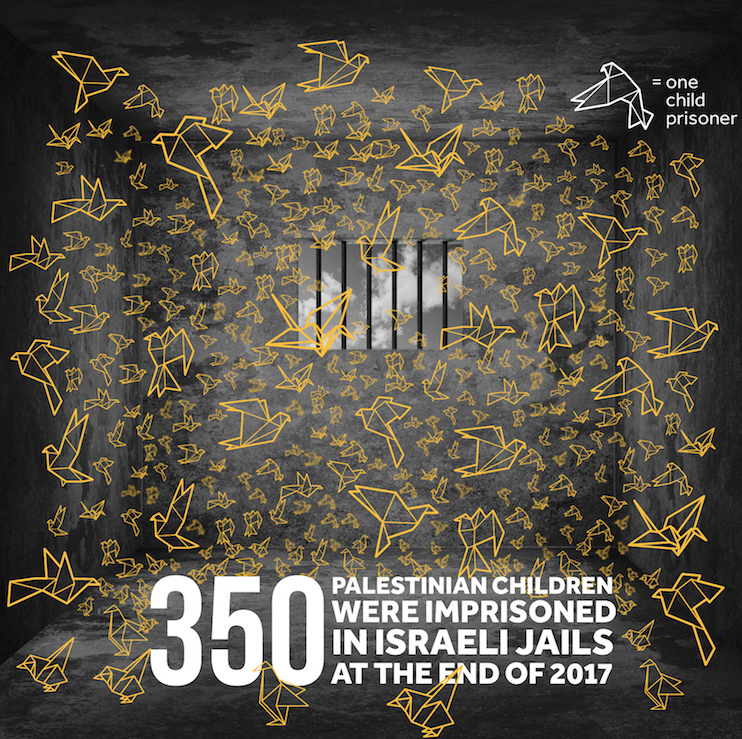 The neoliberal policies subsequently pushed into place divided Palestinians along fault lines of wealth and class, with those connected to the textile industry supporting the dictatorship that in turn supported them, while the rest of the community bore the brunt of economic violence. 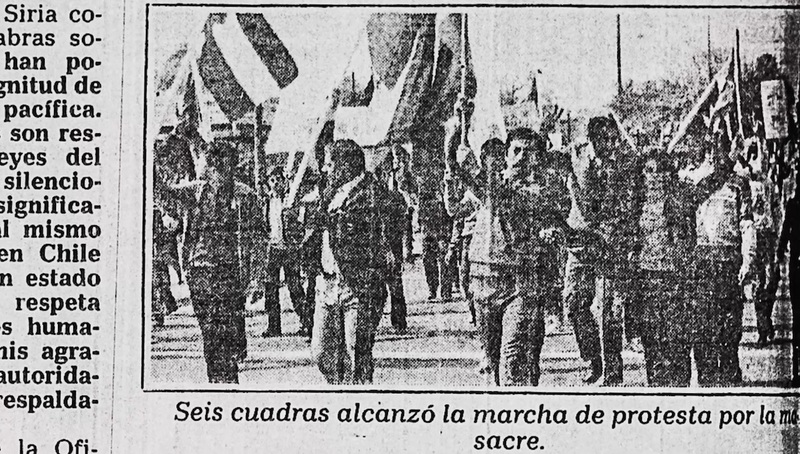 Clip from newspaper coverage of the demonstration in Santiago reads: "the march to protest the massacre reaches six blocks." 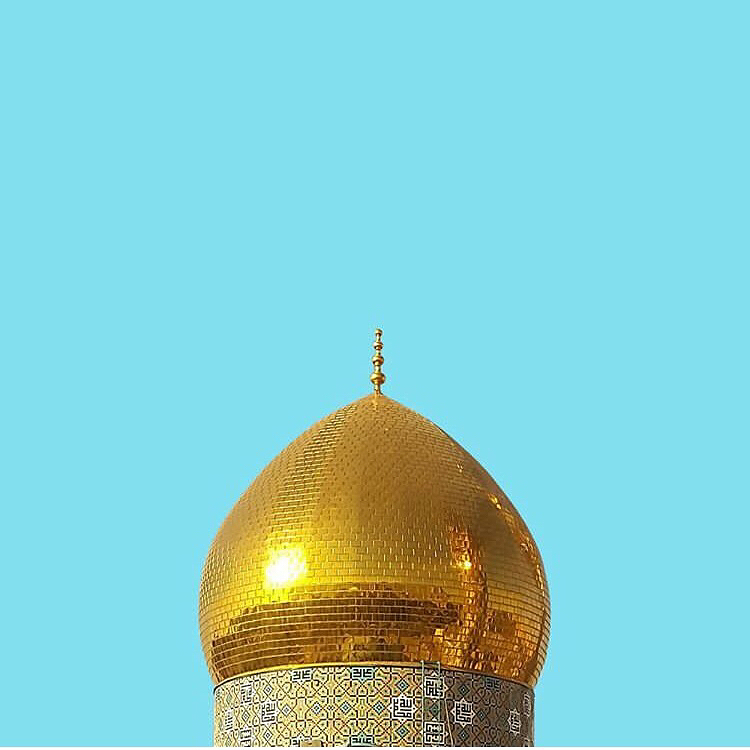 It wasn’t until 1982, with the Sabra and Shatila refugee camp massacre committed by Lebanese maronites with the support of the Israeli army, that the community found itself united again. The first demonstration organised during the Pinochet dictatorship was in condemnation of the massacre. Ever since, the Chilestinian community has insisted on cooperating - across political, economic, and ideological divides - in support of Palestine. “Palestinian-Chilean politicians can be found across the political spectrum from the right to the Communist Party, but when it comes to Palestine, they cooperate,” writes Cecilia Baeza, professor at Universidade de Brasília. 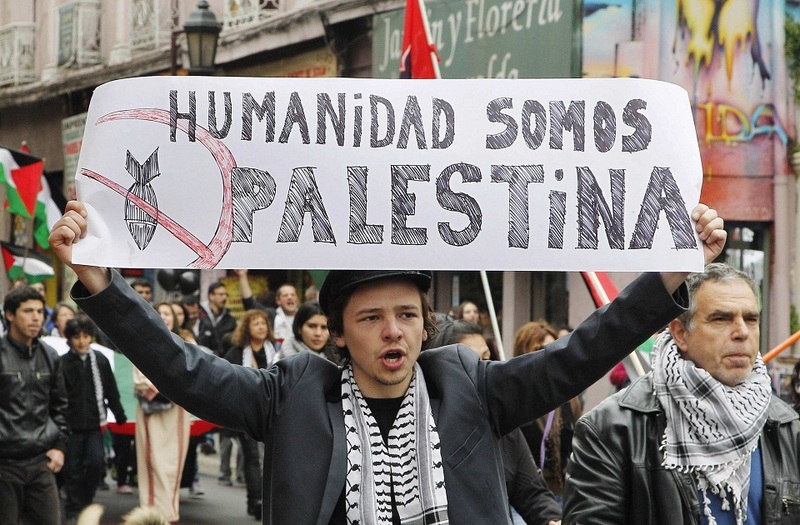 Why I find the word [Chilestinian] interesting is that the community is not Chilean-Palestinian. It’s not a hyphenated identity. More than politics - and beyond the undoubtedly impactful dynamic of economic aid from Chile (which has created a Chile Square and Chile School in the heart of Palestine) - there is also a social and affective element to the historical connection. On one hand, Palestinians living under Israeli occupation are aware and fans of ‘Palestino de Chile.’ “Palestinians are proud to watch the colours of the Palestinian flag waving 13,000 kms away,” says Husni Abdel Wahed, Palestinian ambassador to Argentina. 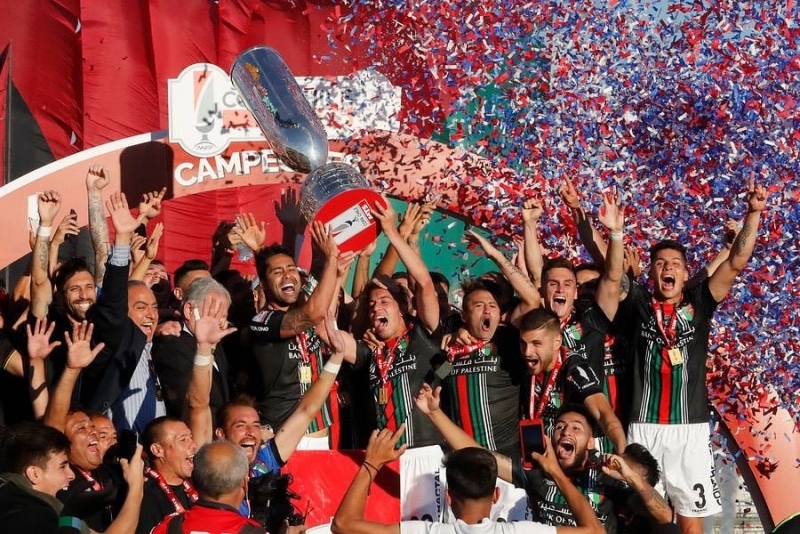 Palestino players celebrate after winning the Chile Cup in 2018. 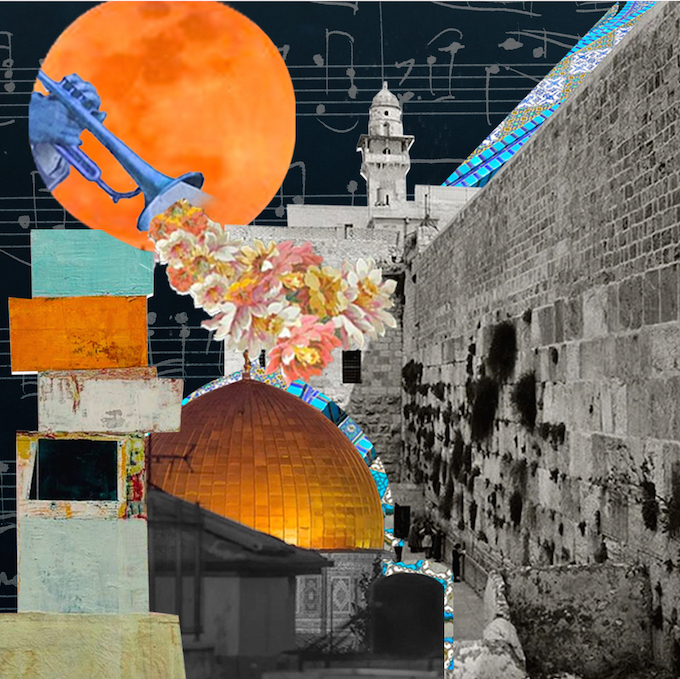 French-American Haiti-born poet of Palestinian descent, Nathalie Handal, touches upon these same dynamics in Barrio Patronato, the title a reference to the working-class neighbourhood of Santiago known as ‘the Palestinian quarter’. - Excerpt from Nathalie Handal's Barrio Patronato, translated by Juan Josė Vėlez Otero, quoted via Tahia Abdel Nasser. 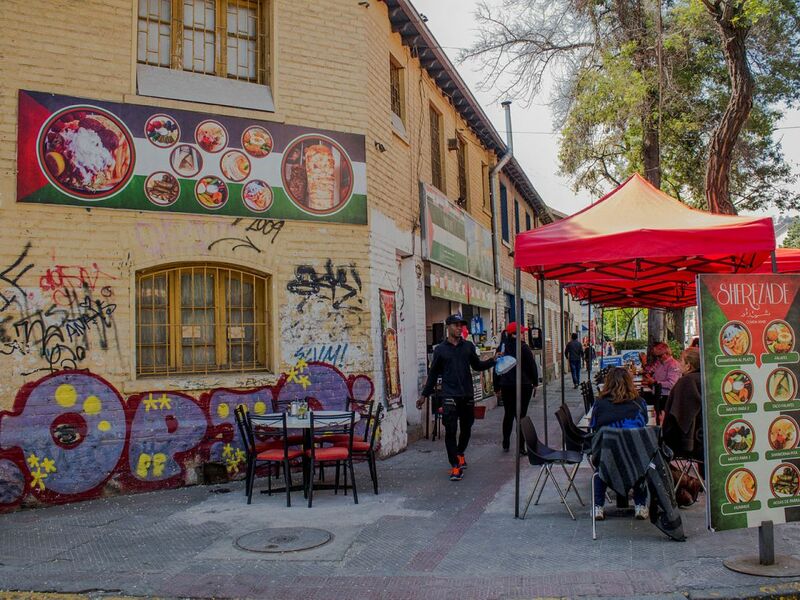 Barrio Patronato in Santiago, image courtesy of Leonardo Vidal. The first demonstration organised during the Pinochet dictatorship was in condemnation of the [Sabra and Shatila] massacre. Instead, the story of Palestinians in Chile is a long history of ardent negotiation, a series of attacks and re-assertions of existence. To regular attacks on identity - at either pole of the 13,220 km line that separates Santiago and Jerusalem - the community holds to its historical maps and nationalist chants in football games. A temporary ban on the flag in Chile left only the one at La Cisterna stadium waving. 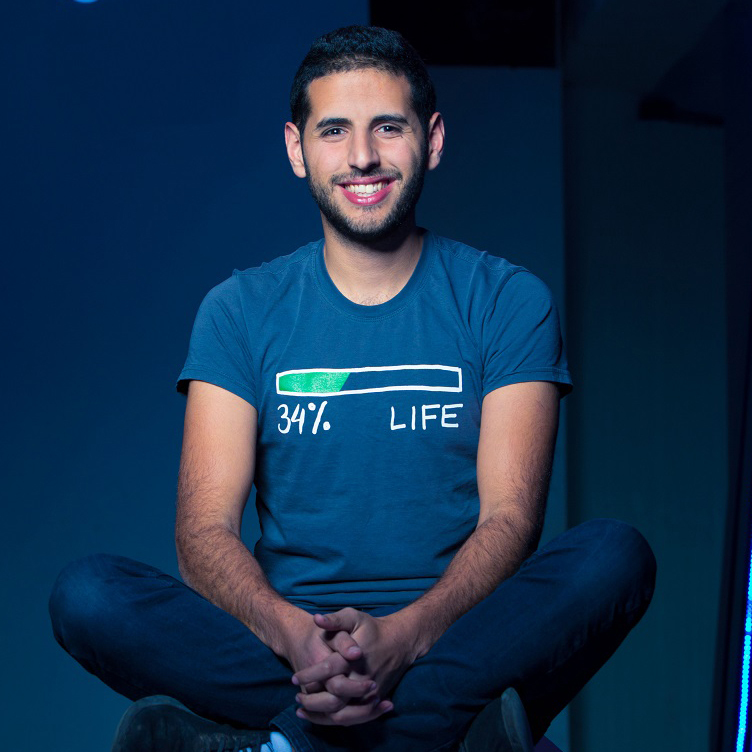 To both the social and political erasure of Palestine, the Chilestinian community has succeeded in creating a hydra of solidarity: from movements such as the UGEP (the General Union of Palestinian Students) that have worked for a Palestinian state since the 1980s, the consistent pro-Palestinian South American voting lobby in the United Nations, and the representation of Palestine across Latin America through - of all things - a football club. Main square image courtesy of Pablo Vera-Lisperguer, AFD Chile.